On December 21, at the very end of the last business day before Christmas week, the US Food and Drug Administration (FDA) quietly released its environmental assessment that found “no significant impact” from the controversial AquaBounty AquaAdvantage transgenic salmon. We’re now in a 60 day comment period that ends on February 25, at which time the FDA is widely expected to initiate formal approval. What is the rationale behind genetically engineered salmon? Why have scientists spliced genes from an eel-like creature called the ocean pout into the genome of the Atlantic salmon? These genes crank out growth hormone year-round, resulting in a fish that grows faster, cutting the time to reach market weight almost in half. This could mean cost savings for fish farmers, leading to higher profits for the salmon farming industry and (they promise) lower prices for consumers. But there are massively disturbing ethical, environmental, and health concerns that make the introduction of Frankenfish highly controversial. Humans have been using natural selection for years to favor certain genetic expressions in animals and plants. But natural selection on the farm is entirely different than taking genes from two or more completely different creatures, and splicing them together in a laboratory. Some people are concerned that the power to create new life now sits in the hands of corporate interests. Others are disturbed by the notion of eating genetically engineered animals when there isn’t even so much as a label to give them choice in the matter. AquaBounty, the company behind the first Frankenfish, insists that their creation poses no threat to wild salmon populations. But research published in the Proceedings of the National Academy of Sciences found that a release of just sixty GE salmon into a wild population of 60,000 would lead to the extinction of the wild population in less than 40 fish generations. AquaBounty insists that their fish will be raised in controlled pens and will never be released into the ocean, and that besides, their fish will be sterile. But every year, millions of farmed fish escape from fish farms into the wild. It’s true that initial introduction of AquaBounty’s fish is slated for Panama in highly controlled pens. But AquaBounty is planning to market the eggs, not the fish. Once the production of GE fish becomes commercialized, it will be impossible to control the whereabouts of every single individual and assure compliance with appropriate containment measures. Some degree of release may be inevitable. As to sterile fish, at present, there is no guaranteed method to produce 100% sterility. In fact, the FDA’s most recent study found that five percent of the animals were in fact fertile. If large numbers of fish escape, it doesn’t take a rocket scientist to deduce that some fertile fish might not only survive in the wild, but thrive. Because AquaAdvantage fish grow many times faster, and become mature much more quickly, than wild salmon, they may have the ability to outcompete wild salmon for food, and to reproduce at a much faster rate. By stipulating that AquaBounty’s fish will never by produced in the United States, the company was able to avoid having to conduct a full Environmental Impact Statement (EIS) that would analyze what would happen if things don’t go as planned. So long as the fish are only produced in countries with relatively lax environmental laws, they may be able to get away without further study. But if the fish escape into the wild, they won’t stop swimming at national borders. This means that if they survive in the wild anywhere, they may soon be driving wild salmon into oblivion everywhere. The impact on marine and freshwater ecosystems, and on the economic wellbeing of fish-dependent coastal communities, could be devastating. The FDA chose to review AquAdvantage as an animal drug, rather than a human food. In the FDA’s view, the refashioned DNA that is in every cell of the fish’s body is considered a drug, and that’s what the agency is regulating. 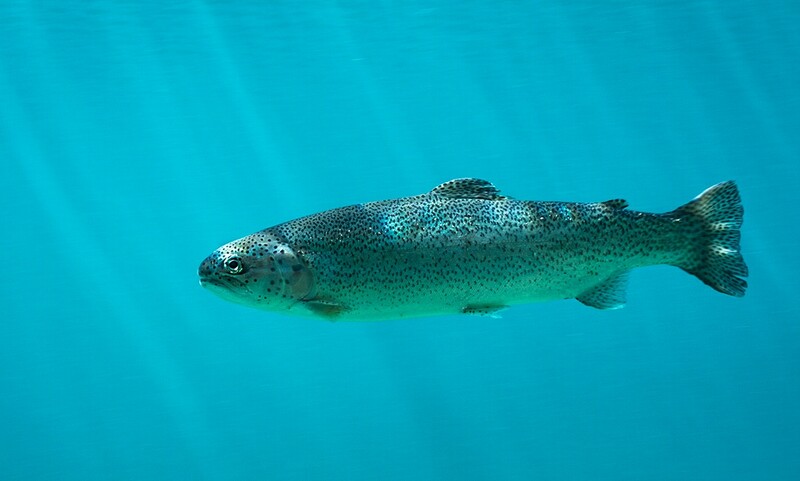 If approved, the AquAdvantage salmon would not only be the first GE animal approved for human consumption, but also the first animal drug that’s theoretically capable of swimming off into the ocean and reproducing. The FDA concluded the salmon to be “as safe as food from conventional (farmed) Atlantic salmon.” While this might be debatable, considering that the genetic makeup of the fish is a new creation, and there have been no long-term studies conducted on humans actually consuming genetically engineered salmon, let’s suppose for the moment that the FDA’s conclusion is accurate. Is being as safe as conventional farmed salmon such a great thing? Salmon has been widely touted for its prevalence of Omega 3 essential fatty acids. And it’s true that wild salmon has low levels of many of the contaminants found in other fish. But farmed Atlantic salmon is an entirely different matter. Many medical experts are already recommending reducing farmed salmon consumption to one serving per month or less. Compared to wild salmon, studies have found farmed salmon to have significantly higher concentrations of contaminants, including such lovely substances as PCBs, dioxins, dieldrin, and toxaphene. If AquaAdvantage does come to market on a large scale, and if it does reduce the cost of farmed salmon, thus making it more widely available and more affordable, is this really a boon to a hungry world? Or might it be a recipe for even more cancer and environmental pollution? Tell the FDA what you think: If you are disturbed by the prospect of a solid green light being given to sale of genetically engineered salmon in the United States, now is a great time to speak up. The FDA’s comment period lasts until February 25. You can submit comments online, or sign petitions like this one. Take action for labeling: Genetically engineered crops are already unlabeled, inadequately tested, and present in an estimated 75% of the foods in America’s restaurants and supermarket shelves. Surveys have found that as much as ninety-three percent of the American public supports the labeling of genetically engineered foods. Perhaps the prospect of genetically altered animals pouring onto American dinner plates without labeling will tip us over the edge from concern into action. To support labeling, sign the Food Revolution Network and Care2?s petition to Congress, or the Just Label It Campaign’s petition to the FDA. Protect yourself and your family: You can get a non-GMO shopping guide and mobile app that can help you and your family avoid genetically engineered foods if you want to do so. And the Food Revolution Network offers a complimentary no-GMO action pack. Ocean Robbins is founder and co-host (with best-selling author John Robbins) of the 60,000 member Food Revolution Network, an initiative to help you heal your body, and your world… with food.